People with mental health issues can face discrimination when trying to rent privately, the Chartered Institute of Housing Cymru (CIH) has warned. It wants better mental health information for landlords and for compulsory awareness training courses. The Residential Landlords Association said that it did not see discrimination on a regular basis but landlords were looking for the lowest risk approach. The Welsh Government said it welcomed the research. Catherine May, from CIH Cymru, said they had heard stories of people who had lost their homes as a result of tenants and landlords feeling they were not able to maintain a tenancy due to the tenant's worsening mental health. She added that nearly half of the landlords they spoke to felt there was not enough advice and information to support tenants. "There should be easily accessible information for landlords and tenants with mental health problems and there should be an online training module as part of the accreditation with Rent Smart Wales," she said. "We think this is really urgent, we're concerned that landlords are ending tenancies, evicting tenants, because they're struggling to cope with their mental health problems and we don't know what's happening to those people but we are concerned that they're finding themselves in vulnerable positions." The number of people living in privately rented accommodation has increased over the last ten years. In March 2017, around 14% of all homes in Wales were privately rented. Hasminder Aulakh, 24, a post graduate law student from Cardiff, started suffering from anxiety in her first year at university away from home. 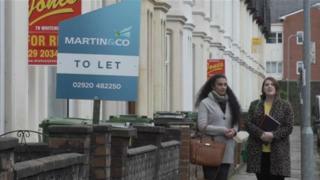 She said a bad experience in the private rented sector over utility bills made the situation worse. "I would cry a lot and be in floods of tears for no apparent reason," she said. "I'd sleep too much or too little. I had counselling and got through my degree and was lucky that I didn't need medication. I manage my symptoms and know I can see my doctor or counsellor." Hasminder agreed that landlords should complete an online course and have more information. "Even though it's extra work, I think it would help the landlords too. A lot of mental health problems are treatable and people are still people. If landlords had better training it would make them feel a lot more comfortable and it could help them in the long run." Douglas Haig, vice chairman of the Residential Landlords Association in Wales, welcomed the report but he is opposed to compulsory training courses and said it was about landlords knowing where to point people for the right help. "Is it a landlord's responsibility to be a support worker, a counsellor or a social worker for their tenant? No, I don't think it is but if they're aware of an issue, then if they can help sign-post the tenant or family onto the right support services then that is something we should look at being able to do," he said. "But to provide support services themselves, landlords are not in a position to do that, they're not trained or capable either." He said he would struggle to see discrimination on a regular basis but landlords were looking for a lowest risk approach. "Saying that, it's about knowledge, understanding and having access to support services when we need them. "At the moment, private landlords are expected to pick up the consequences and support individuals when they're going through particularly difficult times and they don't have the capability or the training to do so. If we can change that, that will reduce what the landlords see as risk for those who do suffer with mental health issues." The Welsh Government said: "Improving access to the private rented sector and putting in place appropriate support to sustain tenancies are both important in helping vulnerable people secure a good quality home. We welcome the contribution this research makes and will be considering its recommendation's with interest."